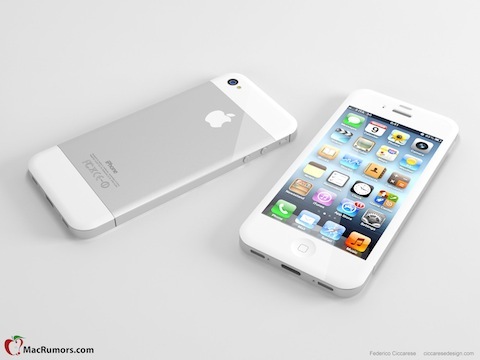 The next iPhone is here, and it is called the iPhone 5. Here you can find a compiled list of release notes from today’s press event by Apple along with pricing information and specs. There are also details on other releases today including new iPod touches with Siri support. You can also find historic rumors, concept designs, photos, videos, and breaking news on the new iPhone compiled from many sources. Are you pre-ordering your iPhone 5 on Friday? Verizon on the other hand may let you keep your unlimited data plan with a catch. Verizon said today that only if you buy a new iPhone at the full retail cost, then it will allow customers to keep their existing unlimited data plans. So in other words, you’re gonna have to pay. See below for pricing details. Call these numbers to see if and when you qualify for a subsidized upgrade to the iPhone 5. 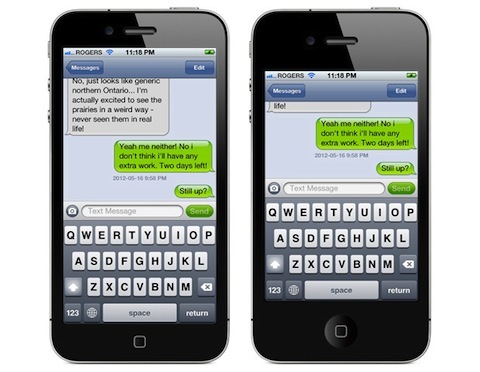 You will get back a text message with the details. 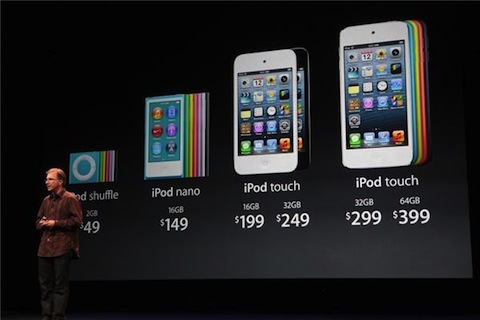 – New iPod touch – faster cpu, better camera. – iPhone 5 Pre-orders start on Friday the 14th. Shipping on September 21st in the US, Canada, UK, Germany, France, Australia, Japan, Hong Kong and Singapore. – Old apps are not scaled or stretched! Just a black stripe? – Retail store updates first, not so exciting yet. – Media guests are now entering the venue to find seats. – The Apple store gone offline in preparation for the media event. – Photos posted last night on Flickr by Ekkapong T showed us the colorful curtains at the event. 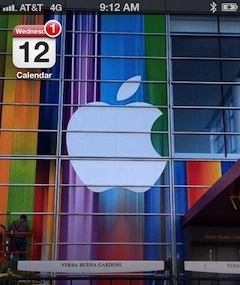 Rumor has it that those are just elongated app icons for various apps on the new iPhone. Today Apple will announce the new iPhone 5 alongside a few other device updates including updates to the iPod touch and the iPod Nano. 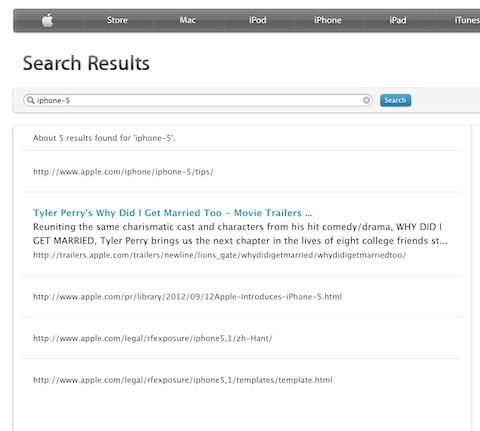 You can confirm this by doing a search on the Apple website for iPhone 5, as noted by MacRumors and find URLs to press releases and tips pages for the upcoming devices. Posted by a Japanese weblog, Macotakara, this video illustrates the front display panel of an iPhone 5 and how it trumps the size of the iPhone 4S screen. 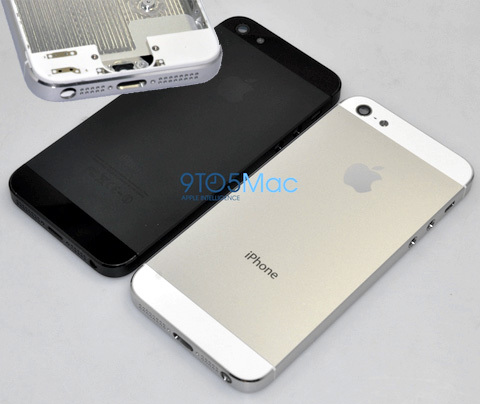 This iPhone 5 part has somehow been leaked from vendors. The front glass panel is bout 10mm high and measures 4.07″ (10.33 cm) diagonally. This confirms the larger 1136×640 16:9 resolution rumored earlier last month. Yesterday Boy Genius Report posted a screenshot of what is supposed to be the new look for the Maps app. This change is part of the upcoming iOS 6 refresh, which is to be announced at WWDC 2012 at 10am PST on June 11th and used in the iPhone 5. 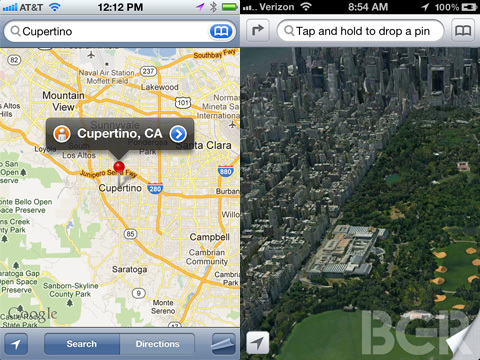 Below is a screenshot of the current iPhone 4S Maps app as compared with the newly revealed iPhone 5 Maps app. Few things to note are: There seems to be a move away from Blue and towards Silver in the user interface, which some say may just be across the entire operating system in iOS 6. The navigation is also cleaner and less busy. Finally you’ll notice photos instead of the arial view currently provided by Google in Maps. Apple has been working hard on replacing Google with its own mapping service. In the summer of 2010 Apple acquired 3D mapping company Poly9, followed by purchasing C3 in the fall of 2011. iOS 6 will finally start to use some of that amazing technology natively on the iPhone 5 and it is going to blow users away. The side story to this is of course the gradual move away from using and promoting Google services by Apple which started already with the new version of iPhoto on the Mac. 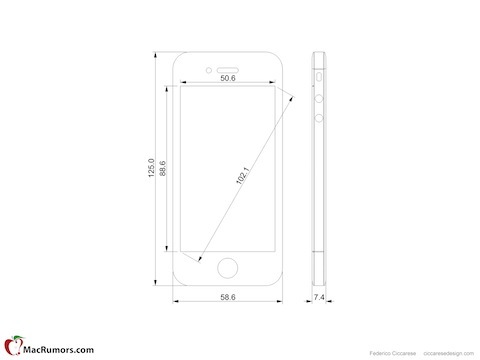 A new video demo from YouTube user DeviceStation labelled “iPhone 5 Concept Design”, suggests the new smaller connection port on the iPhone 5 will be Thunderbolt. This would mean a ton of new abilities over the existing port. The Thunderbolt interface which was developed by Intel and made popular by Apple in the new Macbook Pro laptops, will open up a new realm of possibilities on the iPhone 5 and best of all they are backwards compatible. You can get up to 10Gbps throughput on this thing which can be great for HD video, syncing multiple iOS devices to computers and more. The 9to5Mac website has posted some very high quality photos of the new iPhone 5 which they have gotten a hold of. These photos reveal a new smaller dock connector (Thunderbolt likely) along with the headphone jack both on the bottom of the iPhone 5 and new dotted cut outs for the left and right speakers. Other small changes are: front camera lens is now above the earpiece on the iPhone 5, and the taller display with a different aspect ratio is also verified in these photos. The new iPhone 5 has an aluminum backing instead of the current glass design which may allow for the device to be lighter in weight. A new aspect ratio! Could this be the next iPhone? As reported by 9to5Mac today, Apple has already started testing a couple of new next gen iPhones with a larger display. The new screen size is estimated to be 3.95″ with a 1136×640 resolution which changes the aspect ratio to 16:9 on the iPhone 5. 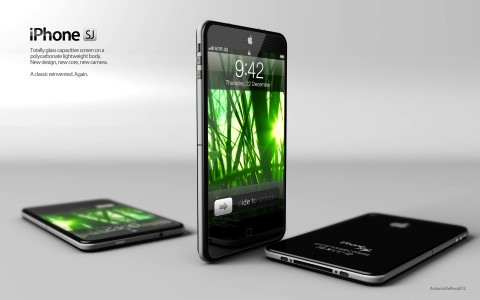 If this is true, it will be wonderful for watching true HD videos and movies on the new iPhone 5 screen. Here is the quote from 9to5Mac.com blog post. You can also check out sample screenshots of what the 16:9 screen would look like, compared with the existing 3:2 960×640 resolution 3.5″ display of the iPhone 4S. Right now we know of a few next-generation iPhone candidates in testing. These prototype phones are floating around Apple HQ in thick, locked shells in order to disguise the exterior design to “undisclosed” employees. 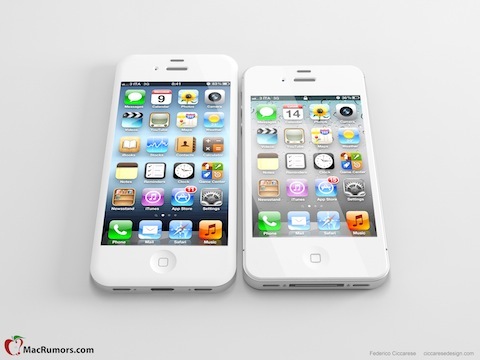 We know of two next-generation iPhones in testing with a larger display: the iPhone 5,1 and iPhone 5,2. These phones are in the PreEVT stage of development and are codenamed N41AP (5,1) and N42AP (5,2). Because Apple reserves certain models for internal-only usage (such as the N96 phone we previously reported on), we’re not sure which of the two devices will make its way into the world later this year. Over the weekend, Italian studio from Ciccarese Design posted a concept design that shows us what a 4-inch display iPhone 5 might look like. Their mocks are very close to the existing iPhone 4S. Modification include a thinner case, a modified dock connector, and a sliver wrapped backing. You can view the rest of their Tall Boy designs on the Ciccarese blog. Verizon just announced that they will not honor unlimited data plans for customers who are moving to new LTE iPhones, which are expected to arrive from Apple later this year. Users who have been grandfathered into unlimited data plans and want to upgrade on Verizon to the iPhone 5 LTE, will have to kill their unlimited internet transfer privileges. Fran Shammo who is the EVP and CFO of Verizon made the statement today: “LTE is our anchor point for data share, so as you come through an upgrade cycle and you upgrade in the future, you will have to go onto the data share plan, moving away from the unlimited world”, as reported by The Verge. What do you think about this upcoming change? Will you re-consider buying a Verizon iPhone? 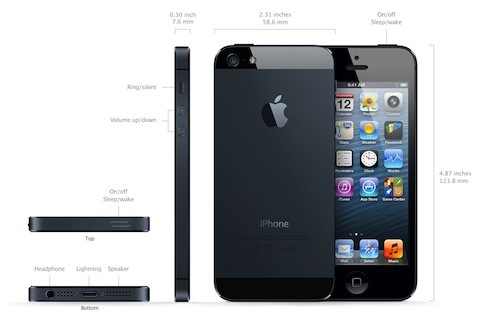 Today there was a report from Apple’s manufacturers which confirms the iPhone 5 will have a larger screen. According to the story from the WSJ, Apple has placed an order for larger screen displays from its Asian suppliers (Display Inc, Sharp, and LG). The existing iPhone 4S screen is measured at 3.5″ while the new iPhone will use a screen that is at least 4″ measured diagonally. 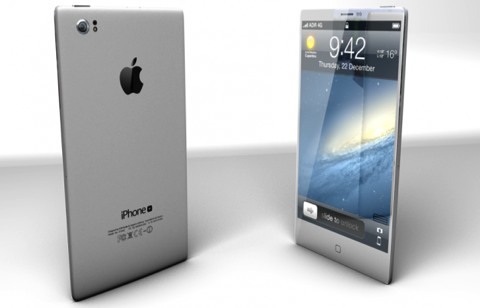 Production of the new iPhone is set to begin in June with a release sometime in the Fall of 2012. The iPhone has had a 3.5 inch screen since its debut in 2007, unlike the competition such as the newly released Samsung Galaxy S III which sports a large 4.8″ display, a 1/2 inch larger than Samsung’s previous phone. 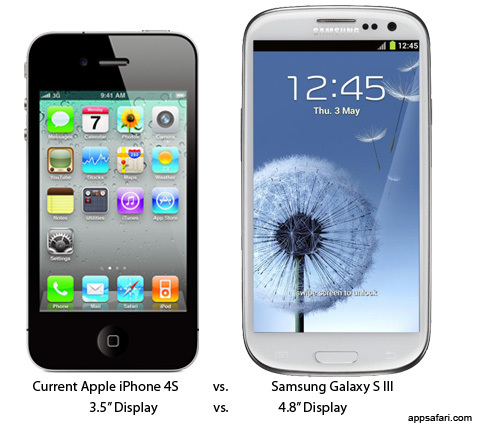 Here is a screenshot of what the current iPhone 4S screen compares with the massive 4.8″ screen of the Galaxy S III. 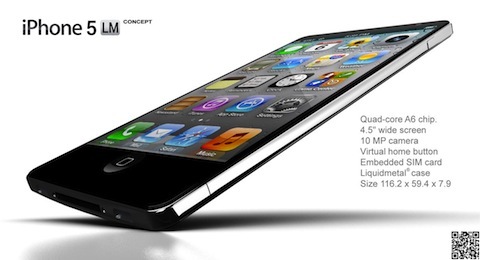 A new concept model for the new 6th Generation iPhone 5 has been created by designer Antoine Brieux of NAK Studio. His next-gen iPhone dubbed iPhone 5 LM shows off the LiquidMetal alloy sleekness of the frame, along with a touch sensitive home button, a 4.5″ screen, and a quad-core A6 chip. Check out all of his design renderings on the NAK Studio website. At this stage we cannot secure enough supply to meet the increasing demand we are experiencing,” Chief Executive Paul Jacobs told analysts on a conference call, adding that the issue would limit revenue growth this year. Demand went so far ahead of availability that we’ve decided to start spending more money to get more supply as soon as possible,” he told Reuters. “Any time we can’t make a customer totally happy I’m going to worry. You don’t want to give a customer a reason to go elsewhere. Another iPhone 5 concept design from Antonio De Rosa, this time he calls it the iPhone Plus which sports a slick liquid-metal thermoformed case and 4.3″ Retina Display with In-Cell technology. The new iPhone also has a slimmer thinner profile which would also require a new dock connector. The phone even includes a Projector to beam photos and videos to surfaces, a 10 Megapixel Rear Camera with 1080p Full HD video at 30 FPS, a Rear motion sensor, and a Fully Capacitive Home Button. 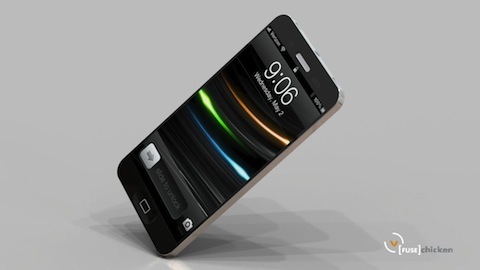 A new iPhone 5 concept model from Italian designer Antonio De Rosa was released recently, which he calls iPhone SJ. His design includes a 4.3″ complete gorilla glass capacitative screen on a polycarbonate lightweight body. Technical features are a quad core CPU, and a rear motion sensor, and a 10 Megapixel rear camera. Here are some iPhone 5 concepts designed by Fuse Chicken that portray a thinner shell casing on the device and a more rectangular home button. You can checkout all the specs used in these renderings including a 10 Megapixel rear camera on the FuseChicken website. The website also shows off the use of the Kickstarter project for an iPhone charger/stand called the Une Bobine. Very good info. I ordered my iPhone 5 Oct 3rd and the status is still ‘Processing’. Will let you know when it arrives and what my thoughts are on it.